Disruption doesn’t come out of nowhere and suddenly hits you in the gut. There are obvious signals we can recognize that either tell us to shore up, or keep calm and carry on. Industries are ripe for disruption when the transaction cost of a component in the value chain plummets (1). Given that the component is critical to the competitive advantage (2). Or in the words of C. Christensen “when an industry’s core technology becomes stretchable” (3). According to this article by Inc. disruption is a direct consequence of the amount of money flowing into an industry. Which is not why the lexicon Industry imploded, the B2C travel agent industry got shredded, the media and music industry destabilized or the financial industry is feeling the heat as we speak. Often it is the opposite, it is money flowing out of the traditional markets that is the clear sign of disruption. According to the theory of disruption incumbents often shy away from disruptive approaches because it destroys margins and/or cannibalizes existing lucrative markets – not because of enormous untapped wealth. Looking at the industries put forward by Inc. gives us a good opportunity to discuss what disruption is, and isn’t. I might get some of these completely wrong – but for the sake of discussing the drivers and elements of disruption, I hope it ads some ideas and insights to the conversation on the topic. Core technologies in health care are shifting from humans to Analytics, IOT, cloud, mobile, collaborative technology and robots. Using new technology to horde data, and powerful analytical engines to crunch it is increasing the quality, precision and efficiency of the sector. At the same time rethinking care through the use of new sources of data, services and even robots are emerging. With software and technology health services can scale to zero marginal cost, deflating the transaction cost of key components in the industry’s value chain. Helping to solve the problem the industry desperately needs an answer to; restructuring and rethinking to remain affordable to future generations. If the customer gets a say in which components in a company’s value chain are important to its competitive advantage, then a shift in customers demand patterns will also shift the company’s ability to compete. New competition is forcing incumbents to rethink their value propositions. From a customer perspective – has the entire financial industry gotten peoples money wrong? Forcing customers to orbit around the infrastructure of money, instead of prioritizing access, administration and use. The finance industry is forced to admit that the core product is not the product – money is not the product – using the money is the product. Going from fossil to renewable energy is hardly disruptive. Rather it just demonstrates the poor match between the existing raw material of record with the needs and wants of the market. It is yet another example where the market is being told what to buy, instead of giving it the opportunity to choose. What we are looking at is the slow-down of an industry, not the disruption of it. This industry has been built on bad profits (“Whenever a customer feels misled, mistreated, ignored or coerced, then profits from that customer are bad” – Fred Reichheld, The Ultimate Question 2.0). Either by forcing customers to pay for products they don’t want (through TV-channel bundles) or by selling out their readership as a commodity to advertisers which in return offer lucrative margins. The industry’s greatest achievement being its ability to limit their own as well as their customers imagination, and lead everyone to believe that the product is ‘as good as it gets’. The industry seems to have lost belief in the ability to capitalize on a quality product, and is going through classic business model disruption. Where the winners believe in their product, are able to differentiate it, and find a way for readers to reward high quality content and punish what they deem to be mediocre. Two things are happening in the automotive industry: The first is a move to self-driving vehicles. Introducing a brand new component in the companies value chain – extreme analytical capacity. Most likely this technology will be something any manufacturer could acquire through companies like Alphabet (former Google). This easy access – for all, might render the new component a commodity as soon as it enters the market place (and will have very little disruptive effect). It is more interesting to look at the consequence of autonomy – as you remove the driving experience customers will demand new types of experiences – who will be best positioned to understand and design these? Apple? The second thing is access – not ownership. This is much more in line with the original concept of disruption; where the product remains largely the same but is destroyed from the bottom through new business models introducing microscopic margins cannibalizing existing lucrative markets. 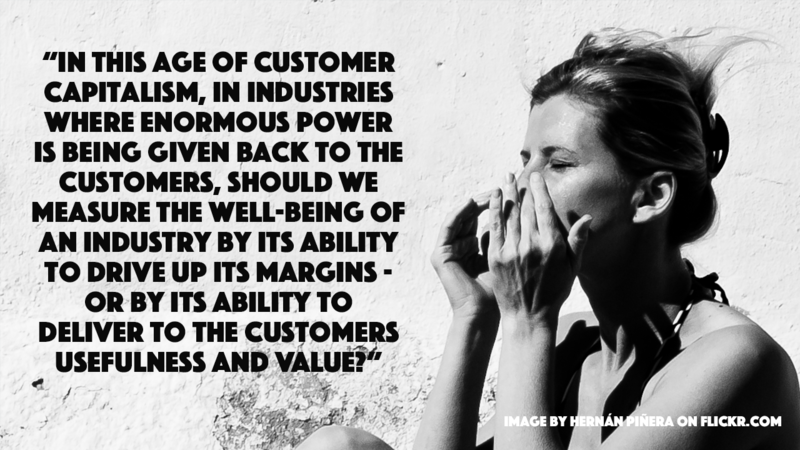 In this age of customer capitalism, in industries where enormous power is being given back to the customers, should we measure the well-being of an industry by its ability to drive up its margins – or by its ability to deliver to the customers usefulness and value.